The release of the latest Off-White x Nike Air Presto in black has finally arrived, and the release of the white version is right around the corner. Since the debut of his Off-White x Nike “The Ten” collection 10 months ago, Virgil Abloh has established himself as a platinum-certified sneaker hitmaker, consistently putting out colorways that are both extremely popular and extremely profitable. How will the latest Off-White x Nike Air Presto perform on the resale market? Consider the 2017 Off-White Air Presto, which debuted last September. Each and every silhouette in Virgil’s original “The Ten” collection proved exceptionally profitable, and yet even by those lofty standards, the 2017 Air Presto was a monster hit. The chart below shows average resale prices for all “The Ten” colorways, compared to the average resale price of the 2017 Off-White x Nike Air Presto. From its release in September all the way to this month, the 2017 Air Presto has consistently outperformed the Off-White average. (Indeed, the only Off-White colorway with higher prices was the Air Jordan 1 “Chicago”.) The Air Presto debuted in September at just over $1,250, had a slight dip in November, then saw consistent price increases over the next 7 months. Currently, the average sale in the month of July is $1,563 – a full 25% higher than its price last fall. Will prices for the 2018 Off-White x Nike Air Presto reach the same dizzying heights as the 2017 version? Thus far, the answer appears to be no. 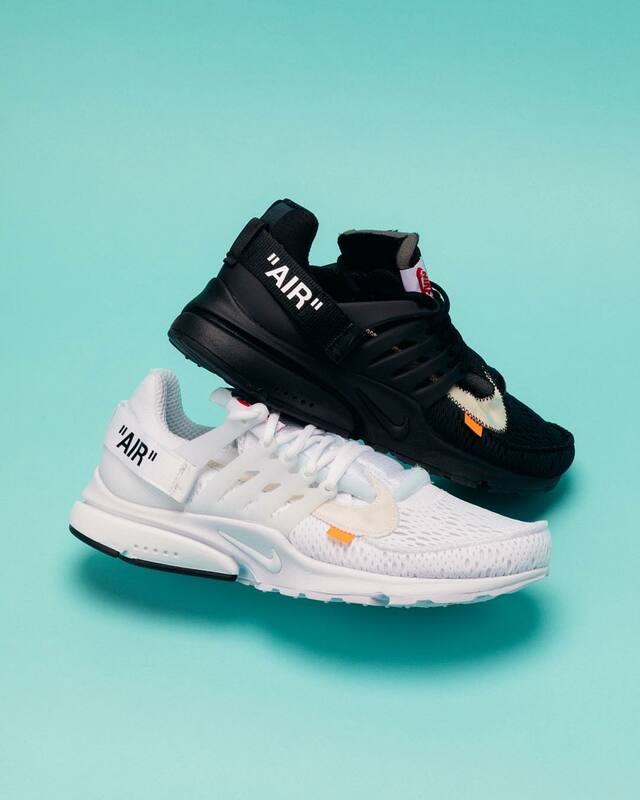 The following chart compares all three Air Presto varients – the original 2017 version, the black 2018 version that releases today, and the white 2018 version that releases next week. The x-axis shows the cumulative number of StockX sales; thus, the chart shows how resale prices change over time as more and more supply hits the market. As you can see, both the black and white 2018 Off-White x Nike Air Presto debuted at around the same price point as the 2017 original- around $1250. But prices for the 2018 versions have declined sharply as supply hit the market. By their 500th sale, the black 2018 Air Presto had fallen below $700 per pair. 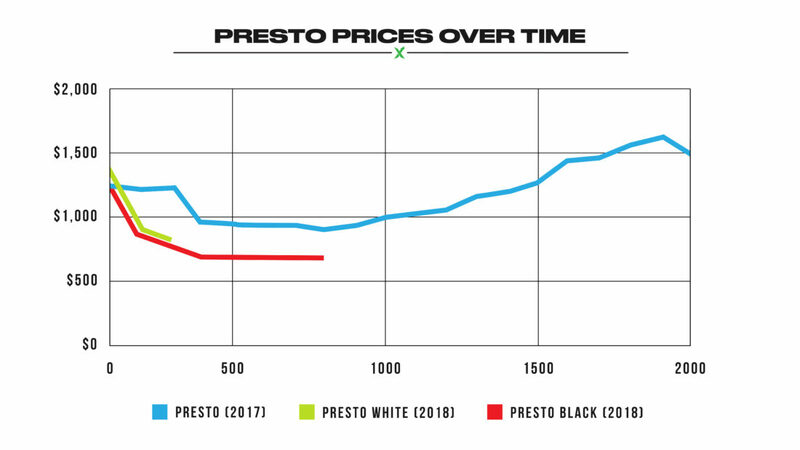 By contrast, the average resale price of the 2017 Off-White x Nike Air Presto never fell below $950 per pair, and for most of its history, stayed well above $1000. The good news, for resellers, is that 2018 Air Presto prices appear to have stabilized. After an initial sharp decline, average prices have stayed within a narrow range of around $670 to $700. It’s possible we’ll see further erosion over the coming days, as supply from the general release hits the market; but thus far, it doesn’t seem to be having much effect. Moreover, if the 2018 trajectory ends up mirroring the 2017 trajectory, we may see prices rising again sooner rather than later.